I began my SCA career in 2006 in Bhakail, in the incipient Canton of Black Icorndall, although it wasn't called that at the time. I started doing music, and going to a few events. I went to my first Pennsic that same year, camped with Bhakail, and fell in love. From that point on, I became more and more involved, going to demos and doing what I could to get the Canton out of incipiency, and it was shortly before we became a full Canton that I held my first office as MoAS. In 2013 I stood up as the Baroness of Bhakail, and it has been an amazing ride. The good folks of Bhakail are the most talented, generous, intelligent and enthusiastic group of people I could image working with, and I am grateful everyday to get to know so many of them. Also received Bhakail Flames, an Ostgardr Sea Star, and a Carillion Chime - all tokens for service. Stranger's Ball, October 2010 - Deputy Autocrat. I believed that we needed a small, relatively simple even that could be run by people who had never run an event before as a way of learning about running an event. It Takes My Child to Raze A Village, September 2009 - General Staff Support. I was involved in much of the planning and logistics of the first RAV held in the Barony. We had the great privilege of hosting Lady Seadhli from the Mid, who ran the very first RAV event. Organized Largess box for Queen Avelina with the populace of Bhakail. Presented at Northern Region War Camp 2012. Organized Largess box for Queen Marguerite with the populace of Black Icorndall. Presented at Southern Region War Camp 2010. Organized Gifts for Barony with the populace of the Canton of Black Icorndall. Presented to Her Excellency Sabine at Yule 2009. Retainer for various Eastern Majesties and Highnesses. Founding member of the Random Dishrag Bardic, a loose organization of people who invade kitchens after events to do dishes, clean up, and sing. 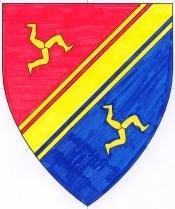 Arms of Legs Akimbo Scroll, Wording, and Fencing blog. St. Salamadria is available for use for all of your saint related projects. I only request that if you create something using her name or story, please let me know and link any blogs or posts to this listing. I would love to see her legend grow! In 834, the army of the king of Naples, in the hopes of defending his borders, engaged in a pre-emptive strike against the barbarians in Germany who were in the habit of looking on Naples with lust in their hearts. The Army set off to the Black Forest to conquer the dreaded Vegegoths where they lived. Salamandria was a 24 year-old spinster living in Naples when she heard the calling to join with the Army and help as she could. The army of Naples fought gallantly, until one night; the Vegegoths invaded their camp unexpectedly. Quick-thinking Salamandria loaded what foodstuffs she was able on the nearest wagon, but alas, there was only so much the poor girl could do. When they regrouped hours later, they found that the only food saved was one pig and one cask of ale. As it started to rain down on their pitiful heads, Salamandria started to pray. After her prayers, she began to gather wood in a pile. The men all despaired though. There was no way to light the fires, and besides, the wood was wet. But Salamandria was determined. She piled her wood high and as she did so, it started to steam, and then smoke, and when she was done gathering her wood, a fire was going, just suitable for roasting pigs. “But we have only one pig, and so many mouths to feed” the army cried, but Salamandria was not deterred. She roasted and carved the pig, but, although there was meat piled high on the platters, the pig never got any smaller. She was able to feed the whole army with the one pig they saved. “But we all have a powerful thirst” the army cried, “and only one cask of ale. But again Salamandria was not stopped. She found a pitcher and filled it with ale which she poured into the mugs of the men nearby. When the pitcher was empty, she filled it up again out of the cask until every mug was full. “But some of us don’t like beer” the army cried. So, sighing, she went to find some bees, which purified the water and made mead in the barrel, and Salamandria passed around mead until all were content. The next day, the army was over-run again, and this time Salamandria was captured. The Vegegoths, upon hearing of her wonders grew angry and tried to kill her. First they shut her up in the barrel of mead that the bees had made, expecting her to drown in her own creation. To their surprise, the next day they heard noises coming from the barrel - singing, and the occasional belch. They pried the lid off the barrel and found her, quite drunk, but alive at the bottom. Angered, they took her out and stabbed her with hickory sticks they found near her fire, but these did nothing but tickle her and make her laugh. Finally in a fit of anger, they threw her on the fire, where she roasted to death. As the Vegegoths watched her slowly dying, they began to repent of their ways. The whole tribe ended up converting. The barbarians and the army of Naples sat down together and shared bacon. At the time of Salamandria’s beatification, there were two sects who followed her examples - the Black Forest Salamandrians who eat bacon and Black Forest ham and the Neapolitan Salamandrians who eat bacon and prosciutto. A third, heretical sect, developed somewhere around Rumania, or possibly Hungary, and they eat bacon and Kielbasa. These groups differ as to which part of the pig is the most important, and whether they should drink ale, mead, or both at their feastings. Some groups celebrate her day with incense that smells like bacon and/or hops in a brazier. St. Salamandria’s symbols are St. Salamandria in her flames, a pig in its flames, a goblet with a halo of bacon in flames, and St. Salamandria tickling a pig with her big toe. St. Salamandria’s day is the Tuesday after Runnymede, as that was the day of her birth." 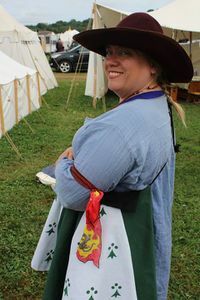 Since then St. Salamandria has also be credited with quelling The Great Dryer Fire of Pennsic 46.